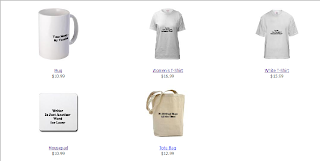 Have you considered making these available on Zazzle or CafePress so that other colors and styles are available for the shirts? I realize the revenue for you would less, but I don't think they must be your only source of distribution for a product. So you might make additional sales with hardly any action on your part. Etsy is another way to get more sales as it's easier for people to find them. Rates to post items are pretty low. And since you created the logo/design for the shirts, it qualifies as a handmade creation. One suggestion: Post images of each item separately and zoomed in so that people can pin them on Pinterest. You'd be surprised by how quickly image/links spread to a bigger audience. There are quite a few ways to get word out with only a bit of time spent up front. Well, okay, this is hilarious, but I also need a new mousepad. Sooooo...maybe you could do a ThinkGeek and just make this joke a reality? You do realize that now you need to actually make a calendar?? Oooh, I want! But I'm not a scammer. Obviously my scam will be to generate paperwork to show I'm a scammer. ROFL! Love the post AND all the comments! I"m laughing at the post and comments but damn it some of those really look like they'd be fun to have in my writing area for a laugh. It may be an April Fool's joke, but consider this carefully: selling these to writers is a good reminder that there are scammers out there, who would dearly love to part a fool from his or her funds. Also, they're funny as heck. Um, I know, I know. But my wife wants me to get rid of my Peace Through Superior Firepower mouse pad. So. Please? Gee, I've gotten so many requests to do this for real that I may have to consider it. With the money going to charity, of course. 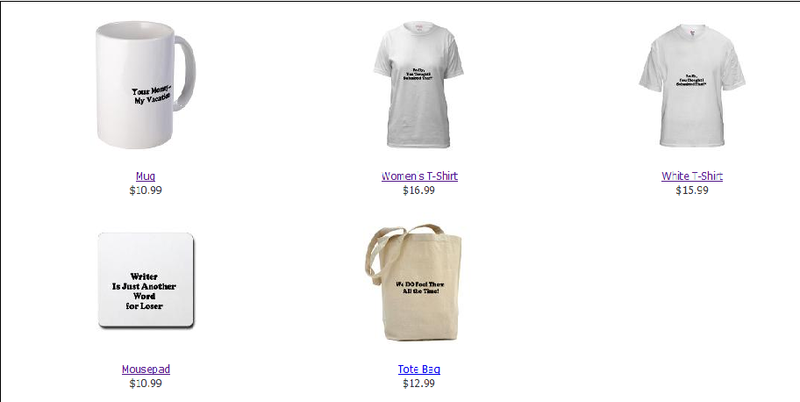 I'd have to come up with some kind of logo for the Swag Shop, though. Hmmmmm. I just want to support the mission of the blog! 10.99 for a mouse pad? Seriously? To really make this work, you need to make it "Writer is another word for looser." I think that captures the scammer-ness more completely. Well, I do a lot of hand dyeing and fabric-related stuff. You can buy "blank" all-cotton T shirts and other garments, and heat transfer paper. Depending on the paper, you can inkjet-print or photocopy onto the transfer paper, your sale motto, book cover, or whatever. It's easy. Personally, I prefer to dye T-shirts a very light color first, because I don't like stark white. My favorite supplies website is called Dharma Trading, and I am not affiliated with them except that I buy dye supplies there. Cafe Press will do mugs, and some authors have their book cover images printed onto mugs there, but I have never dealt with Cafe Press. Sorry, what you do with the heat transfer paper after your image is on it, is position the paper over your T-shirt or other garment and press down with a warm iron.